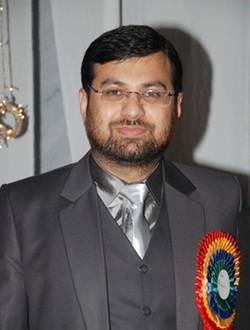 Dr.Salman Malik Kamboh born on 13th June 1982 in District Khanewal (Multan). Then he remained in Saudia Arab with his parents during early school life upto age of 10 years and returned to Pakistan and remained in Ahmed Pur East his native City in 1992 for further Schooling. He did his matriculation in 1st division from F.G Abbas Public School ,Dera Nawab Cantt in 1998 . After Matriculation his family shifted to Lahore, where he did Fsc with 1st division in 2001 from Government College of Science, Lahore .Very next year he took admission in Bachelor of Physiotherapy at School of Physiotherapy King Edward Medical University/Mayo Hospital, Lahore. He remained very active student in curricular, co-curricular and extra-curricular activities. He was very active in organizing all the workshops, seminars and conferences. He passed the bachelor of Physiotherapy degree in 1st division in 1st attempt in March 2007. He was selected as Physiotherapist in June 2007 at School of Physiotherapy King Edward Medical University/Mayo Hospital, Lahore on the same mother institute from where he did his degree. Meanwhile King Edward Medical College is upgraded to University and announces many graduates and post gradates courses along with MPhil Physiotherapy. In December 2007 he was selected in the 1st Post graduate batch of MPhil of King Edward Medical University, Lahore. Recently he completed his MPhil in Physiotherapy, which was not only 1st MPhil in the field of Physiotherapy in whole Pakistan but also 1st MPhil of King Edward Medical University in all his disciplines. Ø Currently he is working as Physiotherapist at Department of Physiotherapy, Mayo Hospital,Lahore,one of the largest hospital of Pakistan from last five years. · Materials & Biomaterials to BSc(HONS) of 13 different disciplines of Allied Health Sciences at College of Vision & Allied Vision Sciences(COVAS) King Edward Medical University, Lahore. He is also coordinator for MPhil Physiotherapy at King Edward Medical University,Lahore. · t-DPT(Transitional Doctor Of Physiotherapy) at University of Faisalabad. Ø He is also member of 1st elected Central cabinet of Pakistan Physical Therapy Association (PPTA) and working as Secretary Information of PPTA. He is running his 3 private Clinics in different areas of Lahore, Pakistan.